Does anyone have some good grey paint colours they can throw at me. I have used Grey Pebble on outside render.....would look different inside. 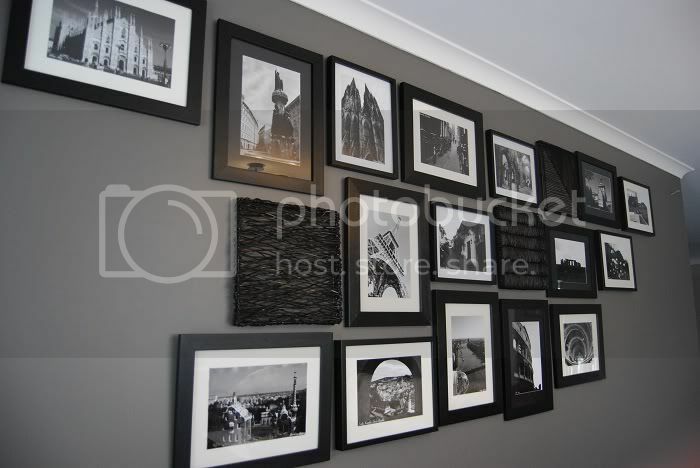 Theatre Room feature wall - Dulux Aumbrey a charcoal/grey and absolutely love it. Pictures on 'Home' post on blog. Well, I am the Queen of grey sample pots. I have been through at least 15 (yes, 15) while trying to find the perfect grey for my walls. I have finally settled on one - Taubmans Grey Comfort 1/2 strength. Bear in mind I am painting directly over Bristol Moon River, which does throw a greenish tint. If I had wanted to undercoat the walls first I would have used Resene Quarter Foggy Grey. Taubmans Inverness is a nice dark grey, as is Dulux Western Myall 3/4 strength. How dark do you want to go? Judie - Funny you should mention Taubmans grey comfort - I fell in love with it after a couple on the block used it last year - I adored the way it looked on their walls but when I got the sample pot it looked way to purple on my walls - shame because I loved the colour. While you’re out, get a sample of Dulux Leadman….its more to the black colour. You could also try Dulux Dieskau or Dulux Silkwort (full or half). I can even send you my sample pots if you'd like (there are lots!). We went Dulux 'Charcoal Light' in the family room. Erin, I love the Charcoal Light on your walls. On mine it looked so brown! Greys are hard to choose, even harder than white I think. I love the charcoal light too!! That is exactly the grey I want - I tried Aumbry which looked fantastic and grey on Debra's walls - sure enough on my walls it looked brown! I have SO many sample pots it is costing me a small fortune and they all end up too purply or too brown! Make sure you let us know the final decision. Here's a photo of full strength Dulux grey pebble. We bought a sample pot and painted an a3 sized sample, and use that to shop for blinds and carpets, but decided to wait till everythings painted and take our time to decide on colours. Thanks Gelatiii - looks great Funny you should put it up because we actually purchased a 4litre tin of Grey Pebble yesterday and DH finished the study last night - I'm really happy with how it turned out and we are now using it in the master bedroom. Good choice! Good luck with the feature wall colour. Grey pebble is the colour I have chosen for my walls. It looks great on your wall. May I ask what colour kitchen cabinetry you are having to go with it? I don't know whether to go gloss or matt. I went with Shannon Oak and Ultra White, it's glossy, Polytec Createc. Thanks for the reply. I picked ultra white out of the sample book today. I'm thinking of having Caesarstone Oyster for the benchtops. Shale Grey or Windspray roof?Shale Grey or Windspray roof? Shale grey looks almost white once up in the roof. I think it’s the light that reflects onto it that lightens the colour. Grey Pebble quarter by Dulux.Grey Pebble quarter by Dulux. Dulux Acratex Dark Grey Vs Monument HELP!Dulux Acratex Dark Grey Vs Monument HELP!